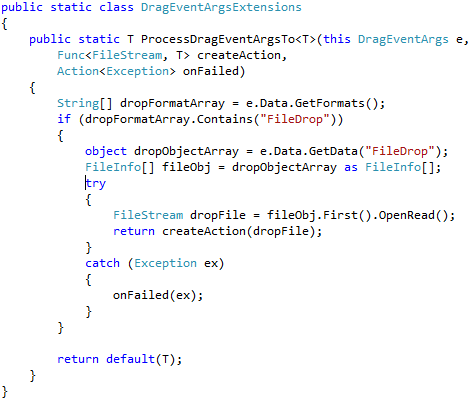 This is an extension method to help a user in processing a DragEventArgs to a object type of their choice. Take a function to create the required Type from a FileStream. Take an Action to handle an exception. Check that the drop array contains a FileDrop. Select the First FileInfo and open a FileStream. Execute createAction with this FileStream. If this fails the exception will be handled by the onFailed callback.